Obviously C&C Generals and her Zero Hour expansion pack are neither new nor even current titles, so this review comes rather late in the day. Nevertheless, with the next generation of titles in the pipeline from EA (in the guise of C&C3) and Chris Taylor’s Supreme Commander (spiritual successor to Total Annihilation), it might be worth highlighting a few of the problems with this older incarnation of the RTS genre. Whilst the genre was built on the single-player campaigns of the original C&C and co., it lends itself beautifully to the world of multiplayer, and this is where the focus of this little review lies. First of all, it is only fair to point out that EA have managed to create an untypically balanced game out of the three very varied factions. 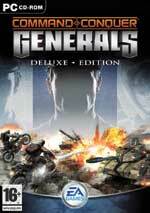 When one counters in the major differences attributable to the ‘Generals’ of the game’s expansion pack, it is surprising that, at least to a mediocre standard of play, the game offers twelve competitive teams and therefore plenty of diversity in tactics, as teams try to exploit one another’s weaknesses. Of course, this is not to say that certain combinations of opponents do not bias the outcome of the game, and at the top level of the game it should not normally be possible, for example, that a China Infantry team will beat a GLA Toxin enemy. Yet simply by looking at the daily win percentages produced on the game’s online service, one can see that although one or two teams generally have a slight advantage statistically, in general the spread between the twelve factions in terms of victories is very close. It should be pointed out that these observations take into account only a low-to-medium standard of play. Naturally at the top end of the game, the rules change almost beyond comparison. But the basic point is that C&C Generals still has regular players of all standards, and as a result, gamers can expect a wide variety of different tactics being produced on the field. The closer one gets to the top, of course, the more emphasis on the ‘real-time’ strategy elements of the genre, i.e. time management – the rush. Getting troops onto the field, micromanaging them, and using them to the greatest effect is the essence of the game, and new players will often find a number of variants in this line being used against them. But to make comparison with WarCraft 3, where nearly every game for the beginner will end in a high-level undead hero and an army of crypt fiends storming into their base, whilst they are yet fighting some local creeps, new C&C Generals/Zero Hour players can expect to at least put up a fight, even where this may sometimes feel to be completely ineffectual. But here is where we find some of the biggest problems with the game. Simply organising a multiplayer game can be a feat in itself. Leaving issues to the game’s netcode aside for the time being, mention has to be made of the deplorable state of C&C Generals’ multiplayer lobby. Whilst in principle everything a gamer could need is in place, simple and easy to use, there are simple too many ‘minor niggles’. Focusing on the game’s “custom game” option, all of the rooms a player could want are present, and whilst a number of these are for the most part empty, this can only reflect the game’s declining status and the natural tendency for gamers to set up games in the busier rooms. The problem comes when setting up a game: the length of time between a game being created and players subsequently being able to join it can vary from a matter of seconds to sometimes over a minute in length. When attempting to coordinate a game with friends therefore, this can be a painstaking process. If the game should fail to work, for whatever reason (more on that later), the players will be exited back to the lobby screen, occasionally into a completely different room than the one they created or joined the game, adding another delay should the player fail to notice and go on creating a new game. Which brings us to the game’s built in buddy list. Aside from an unconfirmed bug regarding the number of ‘buddies’ a player can safely have before it introduces problems starting games, this has to be one of the most ineffectual implementations of a feature of this kind since Steam’s permanently workbench-bound Friends. Whilst the system works beautifully to allow players in different lobbies to find one another, and indeed to chat with players currently playing a game, the list maddeningly allows users to see when their buddies are hosting games – but not join them! It does not even indicate which lobby room the game is hosted in, forcing players to either search the various rooms (hoping the game has already appeared) or else ask. Unfortunately, at times one of the game’s major flaws can mean that the game is only ever fun if one has similarly skilled friends to play with, namely the difficulty which arises trying to find suitable opponents. Trying to tag up games based on players’ skill levels is all very well, but what lies between the well defined ‘noob’ and ‘pro’ levels? Would that be ‘noobish’, ‘semi’, or simply ‘not pro’? Ultimately these labels require players to exude a modicum of honesty and decency in their play. Whilst EA cannot be blamed for the immaturity of a large number of players, they should be apportioned at least some of the blame for the difficulty of judging a player’s skill level. Many players on their introduction to multiplayer Generals will no doubt find themselves crushed comprehensively in what they believed to be a beginners’ game by a skilled veteran, only to then be jeered as a ‘noob’ or some other insult thrown before the final volley artillery barrage ends the game. But didn’t the game say that was his first game? Sadly there is nothing to prevent players creating new ‘accounts’ using a new name and then tricking their way into games below their standard. Fortunately this applies to only the most unscrupulous and immature of players, but that is only the most extreme example of problems in the ranking system. In judging a player’s skill there is only the barest of information to go on; how many games they’ve played under that name (in wins, losses and disconnects), and any hints they can glean surreptitiously from their name or choice of team. Why is this insufficient? Because even as one gains more experience in the game, the win/loss statistics give no representation of how those results were garnered. Has the player been playing only against strong opposition to accrue so many losses? Perhaps the player is a master of the 1v1 rush, but will be lost in the greater scale of a 3v3 battlefield. These amongst other issues often result in it being difficul to find adequately skilled opponents for a game, problems which do not dissipate as a player gets more results under the belt. With the RTS species advanced as far as it has, it seems crazy that such a representative of the genre should come with many of the default options available to the gamer removed. Of course, there are meritted arguments to removing some of the features common to the game’s ilk, such as making for a much simplified interface, allowing the game to be picked up much more easily, and rewarding the better players for micromanaging their troops. But is this any reason to remove the options altogether? Why could they not be hidden not unlike the rarely used ‘guard’ and ‘formation’ features? Changing a unit’s in-game stances, for example, has been a common features since the days of Total Annihilation – Generals makes do with a catch-all ‘retaliation’ button in the options menu. This endemic lack of options extends further into the multiplayer game. It seems reasonable that to play a customised game, players should not be able to record the result in their statistics, but this largely ignores the fact that the game can hardly be altered anyway. Aside from a few general options as regards starting money, and severely restricting team options or superweapons, there is nothing a player can do without using a mod. This results in players making informal decisions before the start, often writing rules in the titles of their games which to players new to the game often seems at first glance to be some sort of insider code. Yet due to limitations in the game’s design, these informal rules can never be anything more than gentleman’s agreements, and are often quibbled over mid-game. Indeed with no solid game restricted definitions, some rules seem widely open to interpretation. Does “no superweapons” mean they cannot be built at all, thereby removing certain upgrades, or does it merely restrict their being used? Does “no rush” include building offensively placed structures? Indeed one other key issue with the game’s design means that when an informal agreement is made dictating how long a moratorium on offenses should last, this cannot hope to take into account any slowdown in the game caused by one/more slow computers amongst players, as there is no time feature built into the game. Some final mention should be made to the game’s few remaining bugs, particularly as regards netcode. To EA’s credit the game generally runs quite bug free, thanks to the fixes included in the expansion pack, and other subsequent patches. The few that remain, such as an unconfirmed bug in the total length of players’ names prevented a 4v4 game from starting, are relatively minor annoyances which do not detract from the gameplay (the difficulty of getting a 4v4 in the first place negates the effect of this added potential bug). However, there are still a few which gameplay bugs and exploits which should have been fixed by EA in what would probably prove to be a final patch. As regards the game’s netcode however, problems would appear so deeply ingrained as to be insoluble. For anyone who has enjoyed the ease of playing a WarCraft 3 multiplayer game, a few clicks away from the main screen, the difficulty of getting a system successfully set up for Generals might seem more complicated than it is worth. Indeed it often appears that where a system has been correctly configured, it might only work in certain situations: often a player will find 1v1 games work a charm, whilst games requiring a larger number of connections (2v2 etc.) might faulter. 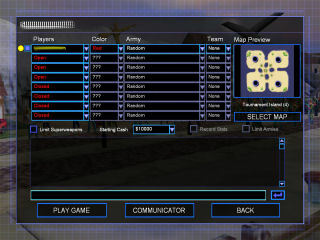 Were it easy to distinguish which player is incorrectly configured, this would not be much of an issue, but as the game often will not load if a single connection is not made, this can be a frustrating experience (worse is when the game does load, only for a player to subsequently be eliminated as certain connections have not been made). And yet the number of ports apparently required for multiplayer Generals play would seem quite overkill, as a quick search on the Internet suggests the following: TCP ports 80, 6667, 28910, 29900 and 29920, plus UDP ports 4321 and 27900. Why any game should require port 80 to be open is unfathomable. 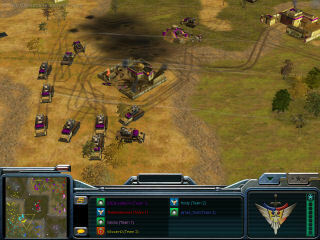 Overall then this game has offered a fairly balanced experience to the RTS genre, and its longevity is only evident from the number of players still to be found on its online system. This is despite the number of problems and poor design features of the online system which detract from playing quick, decent games. The problems of player skill levels could easily be remedied using any number of available models from other ranking systems, and whilst preventing players creating new accounts is perhaps to be avoided, allowing different people to play on the same account (albeit not simultaneously), some form of limit to the number of accounts allowed might deter skilled players from creating new accounts purely for the purposes of ‘noobie bashing’. Of course, before one can even get this far, it is often necessary to have set up some port forwarding or firewall rules to allow the game to even connect to online multiplayer games, which works contrary to what has obviously been an attempt to create an easily playable game. Whilst the purest in me demands options, we can always look to Gas Powered Games’ Supreme Commander for that, but the numerous problems associated with Generals’ online system and netcode are unforgiveable. Some may blame the corporate centralisation within that EA monolith, and if they are right, we can only hope that distribution platforms such as Steam will redress that balance. It may be too late (and no doubt too uneconomical) to fix the problems which hound Generals. We can only hope for better in the future. An excellent summary. I enjoy a simple multiplayer game as much as the next guy, but it is near-impossible to locate players between "noob" and "pro" levels. The lobby structure is ridiculous, and I'm tired of having to decode "3v3 $$$nr/sw/20min$$$". Granted, this is a little better than Starcraft's multiplayer system, which had short titles and no way of seeing the number of players from the lobby, but please, that was 1997. I'm going back to Enemy Territory, which was the fastest game ever for jumping into multiplayer action seconds after double-clicking the game icon.